Let’s start today with some statistics. Here’s an interesting one: my body weight is exactly the same today as it was one year ago. Last April I bought a Tanita Bocy Composition Monitor Scale, which measures not only body weight but also body fat and other measures. It records everything, so I can easily look back and see the history, which is how I know that I am within one pound of my weight at this time last year. What’s that you say? You were hoping for some relevant statistics, since you couldn’t care less how much I weigh? 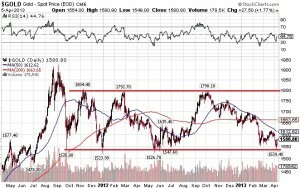 Okay, how about this: Since October, 2011 the price of gold has remained locked in a trading range between $1,523.90 (at the end of 2012) to a high of approximately $1,800 (specifically $1,804.40 in November 2011, $1,792.70 at the end of February 2012, and again up to $1,798.10 in October, 2012). Gold and JDH: we never waiver! Or, perhaps a better way of stating it: Gold and JDH: Stuck in a Rut! You can click on the chart to blow it up, but the consolidation pattern is clear; gold drops to somewhere in the $1,524 to $1,535 range, and then bounces back up to just shy of $1,800, and then does it again. Three times it’s bounced in the range, and it would appear that we are testing the fourth bounce to the bottom of the range. That brings us to today’s question: Did we bounce off the bottom this week? Are we heading higher? Perhaps. The intra-day low on Thursday was $1,539.40, and Friday traded as high as $1,580.90, closing near the high for the day at $1,580.80. That’s a $41.40 bounce off the bottom, or a 2.6% bounce. That’s convincing, but too early to draw any conclusions. 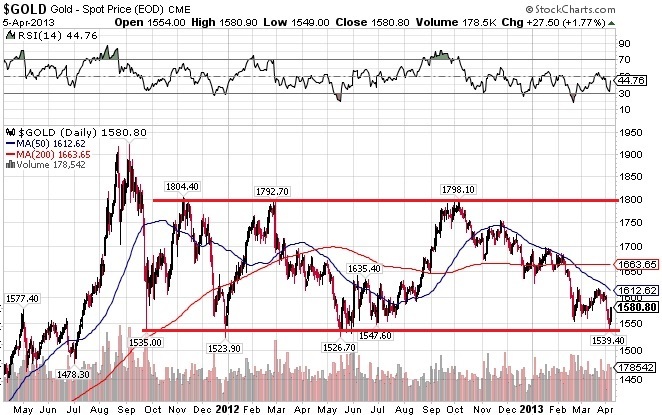 When we tested the bottom of the range in the summer of 2012 it bounced many times, so let’s wait and see. I have no idea what will happen day to day or week to week, so I don’t try to guess or time the market. If I had to guess, I would say that we have been trapped in a consolidation for nineteen months, and I see no evidence that the trading range is ending. I will be surprised to see $1,500 anytime soon, but I will also be surprised to see $1,800. We are stuck. I also have no doubt that one, or two, or three years from now gold will be much higher, because that’s the inevitable result of fiat money printing. So, for the solid, well capitalized stocks I like, I will continue to hold them. For weaker, under-capitalized stocks, I will continue to “thin the herd” to have cash available, because I want to be ready for the inevitable break from the consolidation. If we break to the down-side (ie. gold below $1,500), then I want to have cash to average-down and buy some great bargains. If we break to the upside (over $1,800, perhaps due to military action in North Korea, or the Middle East, or wherever) I want to have a position in gold as insurance. As sunseeker and sidewinder discussed on the Buy High Sell Higher Forum this week, stock market weakness in the summer isn’t unusual, and you shouldn’t have all of your eggs in one basket, so be aware of your long term strategy, and rest easy. It will be a while before the end game is revealed. Thanks for reading. I’m off for a brisk early spring run to keep my weight in it’s consolidation range. See you next week.